Whether it be alcohol or drugs, addiction has a way of camouflaging itself from the eyes of the addict. Behaviors that seem perfectly normal to a drug user appear as clear signs of a growing problem by friends and loved ones. Not surprisingly, denial is one of the hallmark symptoms of addiction, according to. According to the Florida Institute of Technology, the effects of drug use impair a person’s logic and reasoning making it all the more difficult to see things as they really are. These effects also make it easy to ignore symptoms of addiction, especially the subtle ones. 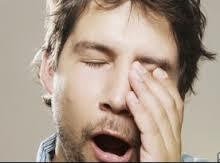 Constant drowsiness is a sign of addiction. Alcohol, sedatives and opiate-type drugs have a sedating effect on the body as well as on a person’s ability to maintain normal waking hours. In cases of heavy drug or alcohol abuse, users can actually experience brief lapses in consciousness at any time. Someone who falls asleep on a whim or sleeps throughout much of the day may be exhibiting symptoms of addiction. Prescription pain pills rank number two as the most abused substance after alcohol. Also known as opiates, people addicted to prescription pain medications may devise a range of tactics to maintain their drug supply. Pain symptoms that never seem to go away is one such tactic. Someone who always seems to be “going to the doctor” or frequents multiple doctors’ offices may well be addicted to opiates. Over time, drugs and alcohol deteriorate brain and body functions to the point where users develop ailments on an increasingly frequent basis. As most all addictive drugs interfere with a person’s ability to get a good night’s rest, days or weeks of no sleep sets the stage for other forms of illness, such as colds and flu, to take hold. This symptom of addiction may also indicate withdrawal effects. Stimulant drugs, such as cocaine and prescription amphetamines stimulate most every bodily process, including metabolism. At the same time, these drugs greatly reduce a person’s appetite. Before long, users start to lose weight at a rapid pace. Considering how American culture views “slim and trim” as a good thing, someone struggling with a stimulant addiction can easily fall between the cracks. Much like the sleepless nights that come with stimulant use, this symptom of addiction can also compromise a person’s overall health. Once a person becomes addicted, getting and using drugs takes on top priority in his or her life. This means, someone who wouldn’t ordinarily lie repeatedly will easily resort to fabricating stories in order to hide a drug problem. The effects of drugs on reasoning and judgment account for why this symptom of addiction becomes so easy to do. Addiction progresses in stages, so someone at the early stages of addiction can still function normally in everyday life provided he or she has access to drugs (or alcohol) at all times. As many drugs tend to leave odors on the breath or clothes, someone trying to hide an addiction in the workplace will likely always be using gum or breath mints. Constant “mouthwash breath” also fits in with this symptom of addiction. Since prescription drugs require a doctor’s prescription to obtain, addicts have to come up with innovative ways to maintain an ongoing supply of drugs. In this respect, friends and family can unknowingly become a rich supply source in terms of what they keep inside their medicine cabinets. Addicts will always “have a need” to use the bathroom in other peoples’ homes. Regular alcohol and drug use wreaks havoc on a person’s emotional stability. Before long, noticeable mood swings start to happen more and more frequently as drug effects create rampant chemical imbalances in the brain. With this symptom of addiction, a person can go from perfectly calm and content to angry and aggressive for no apparent reason. With ongoing substance abuse, the brain develops a tolerance to the effects of drugs and alcohol. Increased tolerance levels result from the damage caused to brain cell structures. When this happens, the usual amount of drugs or alcohol won’t produce the expected “high” effects. Since tolerance levels will continue to rise for as long as a person keeps using, he or she will have to keep ingesting larger drug amounts in order to experience the desired effects from the drug. This symptom of addiction becomes a driving force within the drug abuse cycle. The addiction lifestyle requires a certain degree of camouflage, especially when it comes to friends and family who don’t approve. In order to avoid conflict, addicts may develop a network of hiding places or designate certain areas of the house as “restricted.” Hiding places can take the form of linen closets, a corner of the garage or glove compartments. As the effects of drugs start to take over a person’s lifestyle, it becomes harder and harder to justify his or her behaviors and choices in the face of friends and family. Rather than admit the problem, addicts resort to blaming those closest to them for mishaps that result from their drug activities. This symptom of addiction can quickly destroy friendships and tear families apart. According to the U. S. Department of Justice, substance abuse and mental illness go hand-in-hand, especially in cases of long-term drug use. Once addiction reaches a certain point, chemical imbalances have created a diseased environment in the brain. In this respect, symptoms of addiction may take the form of depression, anxiety episodes and paranoia. Getting and using drugs takes up chunks of time, especially when addiction takes hold. Hiding these behaviors requires addicts to miss out on events or seemingly disappear for long periods of time. As addicts tend to have excuses ready at hand, this symptom of addiction can be easy to miss. The effects of addiction can turn an honest, forthright individual into a master manipulator when it comes to keeping his or her problem a secret. A person may admit to using every now and then to one person, while telling another person he or she only smokes marijuana when heroin is the drug of choice. Ultimately, symptoms of drug addiction take over a person’s life to the point where other interests, pursuits and activities gradually fall by the wayside. The addict’s world becomes smaller and smaller leaving a shell of the person in its wake.